The WMA-16-23 23.5" Deep Wall Cabinet (16U) from Atlas Sound is a wall-mount assembly (WMA) cabinet designed to accommodate deep components. The unit can be mounted on any structurally sound concrete wall or in steel or wood wall studs. Once mounted, the front section of the cabinet swings open for quick and easy access to the back panels of your equipment and its cabling. The cabinet features the Atlas "alignment frame," which makes for a more solid design by providing support throughout the complete center section. Its side-lock security system also strengthens the cabinet with a design that joins the center section to the back pan. Rack rails in this unit can be fully adjusted from front to rear. Moreover, rack rails feature hash marks to indicate rack increments. The back pan includes raised mounting embosses to accommodate power units and other accessories. It also features a knockout, allowing for easy cable access through the mounting surface. Internal braces and multiple knockouts on the bottom and top of the rack further facilitate cable management. This unit can be customized with a wide range of add-on accessories, including solid or perforated front doors, rear rack rails, side-mount fans, and fan panels. The cabinet is constructed of steel and features a black electrostatic powder-coat finish. Move your components from the floor or your desktop and mount them on the wall with this convenient unit, giving you more work area real estate and easier access to your equipment. This unit includes several unique design features to ensure its durability, including a specially aligned frame, a side-lock system, and internal braces. The cabinet includes numerous knockouts to facilitate the management of abundant cabling. A number of add-on accessories are available for this unit, allowing you to build a custom system that meets your exact needs. 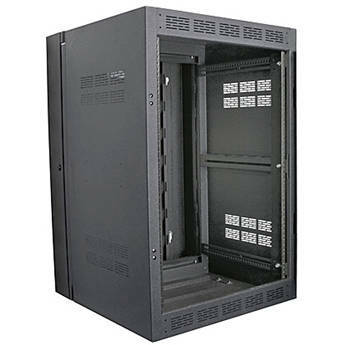 Box Dimensions (LxWxH) 39.5 x 30.0 x 28.0"
WMA-16-23 23.5" Deep Wall Cabinet (16U) is rated 4.0 out of 5 by 1. Rated 4 out of 5 by Anonymous from Good cabinet Very well built cabinet. Only issue is the hinge pins have to be installed from above and below the cabinet. You have to make sure you have proper clearance on top and bottom to install and remove the cabinet from the wall bracket. I prefer spring loaded pins from inside the cabinet.